Health care policy expert Michael F. Cannon of the Cato Institute brings us yet another astonishing display of fact-check incompetence from PolitiFact. PolitiFact Georgia is the culprit this time. In an unconscious parody of everything that’s wrong with the “fact-checker” movement in journalism, PolitiFact Georgia (a project of the Atlanta Journal-Constitution) has rated false my claim that operating an ObamaCare Exchange would violate Georgia law. Cannon offers a devastating and conclusive rebuke of PolitiFact Georgia, and it's so elegant that putting the argument in our own words is pointless. But to sum up, PolitiFact committed one of its traditional sins by incomprehensibly misinterpreting what the subject was saying. PolitiFact charges Cannon with claiming that it is illegal for anyone to operate an insurance exchange in Georgia. Cannon was talking specifically about the states setting up their own exchanges. Could the context make it any clearer that Cannon refers to state-created exchanges with the arguments that follow? The subsequent arguments augment the clarity. [Cannon] wrote a claim we hadn’t heard before. "[O]perating an Obamacare exchange would be illegal in 14 states," he wrote. "Alabama, Arizona, Georgia, Idaho, Indiana, Kansas, Louisiana, Missouri, Montana, Ohio, Oklahoma, Tennessee, Utah, and Virginia have enacted either statutes or constitutional amendments (or both) forbidding state employees to participate in an essential exchange function: implementing Obamacare’s individual and employer mandates." Is that correct? PolitiFact Georgia decided to conduct an examination of the claim. Does the federal government propose to operate a federal exchange in Georgia using Georgia government state employees? How is that supposed to work? Don't let our brief summary prevent you from reading Cannon's whole response. It's just another example of amazing incompetence from PolitiFact. Props to Cannon for standing up to this form of media tyranny. Despite Bill Adair's assurance that PolitiFact "publishes a list of sources with every Truth-O-Meter item" in order to "to help readers judge for themselves whether they agree with the ruling," Cannon notes that the context of his original article "was lost on PolitiFact readers, because PolitiFact provided neither a citation nor a link to the opinion piece it was fact-checking." As of the time we write this, there is in fact a link to Cannon's National Review article posted on the PF Georgia source list. This means either Cannon was wrong, or PF Georgia amended their article without informing readers of an update, correction, or even an editor's note to document the change. Considering PolitiFact's long history of inconsistent application of their corrections policy, we're inclined to take Cannon's word for it. Big thanks to Jason Hart over at Media Trackers for mentioning us in his recent article. We've highlighted his work before and it's always worth the read. Hart focuses on PolitiFact Ohio, but their problems are representative of PolitiFact's operations as a whole. Few journalists have been as dogged at exposing PolitiFact's flaws and we commend Hart for his efforts. Make sure to read his post. On August 1, PolitiFact Bias published research showing partisan bias in the application of the "Pants on Fire" rating. The research paper argues that PolitiFact's failure to offer an objective criterion separating "Pants on Fire" from "False" makes it a potentially good indicator for ideological bias. 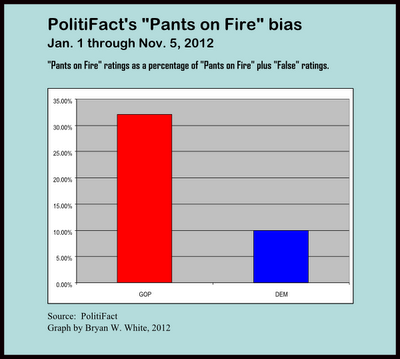 The research paper looked at collected "False" and "Pants on Fire" ratings from PolitiFact's beginning in 2007 through the end of 2011. We've continued to collect the data and perform the bias calculations. [See Update and Correction below] GOP claims were 3.2 times more likely to receive PolitiFact's harshest and apparently subjectively determined rating than those coming from the Democratic Party. Our research expresses the discrepancy as a PoF Bias number, 3.21 in this case. Here's a preview of the 2012 PoF numbers from our research on PolitiFact's state operations. Yes, the blue numbers indicate a bias against Democrats in the application of "Pants on Fire" ratings. But don't go jumping to conclusions. Wait for the publication of our next research project (unless you figure it out on your own). Update and Correction 1/31/2013: While verifying a year-end summary of the research data, I found a "Pants on Fire" claim from President Obama I had overlooked from early January in 2011. The PoF Bias number, after adding in the missing rating, is 2.25 rather than 3.21. The graph is wrong. The blue column should come up a tad over 14 percent. The revised figure continues to show a marked bias against Republicans, and the high impact of just one more "Pants on Fire" rating on the Democrat side shows how the low number of ratings for Democrats makes the proportions sensitive to minor changes. That fact makes the relatively consistent trend year-by-year in favor of Democrats (following 2007) all the more telling. Note: Bryan and I appreciate the tips and suggestions we receive from our readers. Encouraging people to do their own skeptical research of PolitiFact was a primary goal of starting PFB in the first place. But rarely do readers send us ready made blog posts. One such reader (who has asked to remain anonymous) recently did just that. We've made some formatting changes but the following post is largely unedited. Do women get paid less than men? It depends on who's getting rated. Politifact showed its bias recently through the glaringly obvious inconsistency between the 26 Oct ruling on Mitt Romney's claim of White House women earning less than their male counterparts, and the 5 Sept ruling on Diana DeGette's statement of effectively the same thing. Each person basically said that women earn less than men, though DeGette was referring to the U.S. as a whole, while Romney was referring to the Obama White House.What was the difference that allowed DeGette to earn a Mostly True versus Romney's Half-True? It's worth noting that both claims were judged against the light of discriminating factors such as gender differences in occupation, education, experience and hours worked. This is an outstanding example of Politifact's arbitrary ratings system because it's so easy to see the issue in a non-partisan light. Readers must ask themselves if partisanship is the only reason for the disparity. Romney and DeGette made very similar statements. Whatever rulings they receive, they at least must be identical. What's most absurd is the Romney story contained a reference to the DeGette story, and actually used the fact that the White House pay gap is smaller than the overall gap to knock Romney's claim down a rung. The Politifact staff had this mistake glaring them in the face, and they still didn't see it. Were they blinded by their bias or an agenda? Our alert reader hits some solid points. To point out DeGette's rating in the Romney article and cite it in order to lower Romney's rating is baffling. What's even more absurd is DeGette came up with a specific figure of $0.77, while Romney used the more general term "less than." You'd think a broader margin of error would help Romney. The discrepancies should have been picked up by Angie Drobnic-Holan, as she was the editor on both rulings. Many thanks to our anonymous reader! We encourage everyone to send in your tips, and analysis. On Oct. 5, 2012 PolitiFact published a fact check examining Vice President Joe Biden's claim that the Ryan budget would result in a $460 annual tax on Social Security recipients. Biden's claim was based on filling in blanks of Romney's budget plan based on extrapolations. PolitiFact ruled the claim "Mostly False." 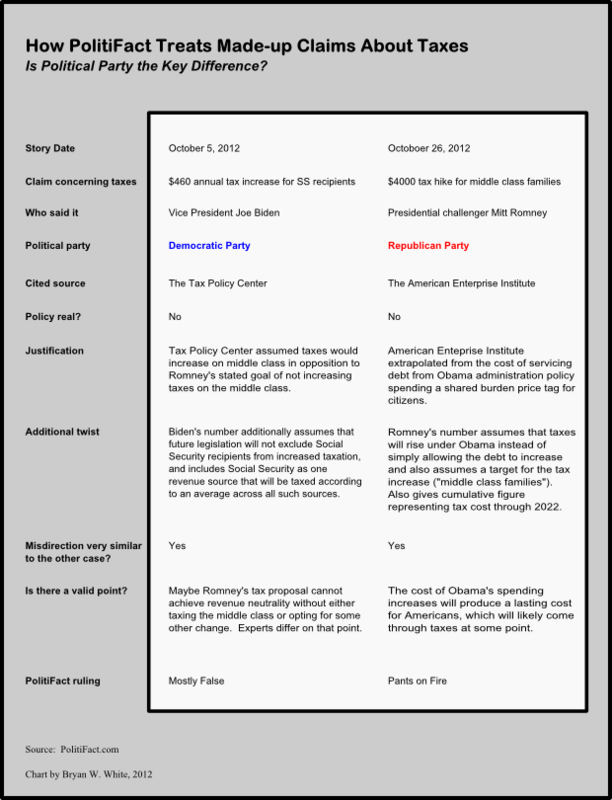 On Oct. 26, 2012 PolitiFact published a fact check examining a Romney campaign claim that President Obama's policies place a $4000 tax hike on middle class families. The Romney campaign's claim was based on translating the accumulated interest from Mr. Obama's spending programs into a tax collected over a 10-year period. In other words, the Romney campaign extrapolated from the ongoing costs to place a number on a tax that Mr. Obama has not proposed. PolitiFact ruled the claim "Pants on Fire." We think the comparison helps illustrate the arbitrary nature of PolitiFact's rating system. In both cases, the claim is based on the made-up existence of a proposed tax. Update Nov. 6, 2012: The image did not behave as hoped when clicked upon, so it's been re-sized and embedded at its actual size to make it easier to read. The page may load more slowly than average as a result.